Ideas and protocol for campus events planners. For a person who plans ceremonies, there is nothing to compare with a royal wedding! On Saturday, I was up early, fixed a pot of tea with fresh scones, strawberry jam and whipped cream (the closest I could get to clotted cream in northern Alabama) and glued myself to my computer to soak in every detail of Harry and Meghan’s big day. It didn’t disappoint. The ceremony was modern as befitted the bride and groom yet filled with traditions representing both of their heritages. The significance of the day was beautifully expressed through hundreds of symbolic details that tied past to present. Meghan chose to wear Queen Mary’s Diamond Bandeau Tiara which featured a brooch that the queen had received on her wedding day in 1893. Meghan carried a bouquet that had snips of myrtle from The Queen’s garden, just as other royal brides before her. Harry and Meghan’s rings were formed from a nugget of Welsh gold, following a 100-year tradition that was established by the late Queen Mother. The service incorporated not only traditional Church of England hymns, but songs from the African American gospel tradition in salute to Meghan’s heritage. 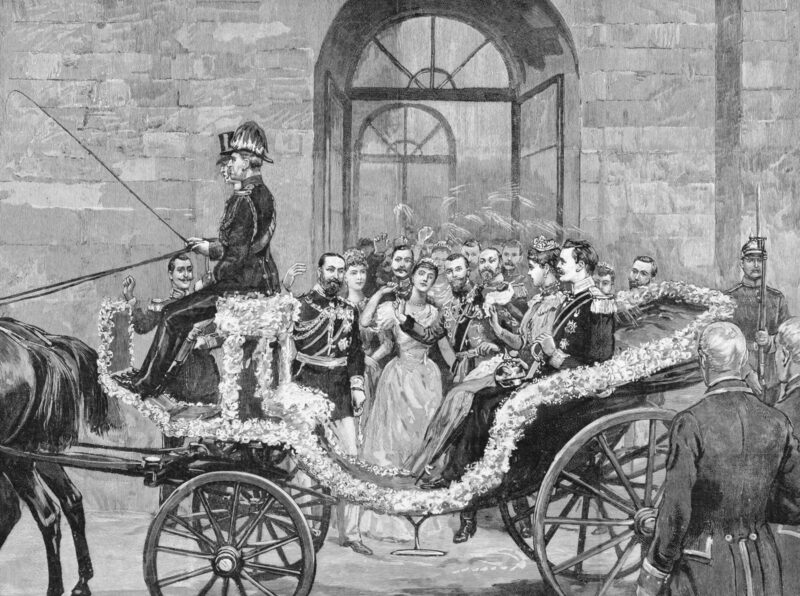 Now known as the Duke and Duchess of Sussex, the couple took a celebratory ride through Windsor in an open carriage built in 1883, the same one that has been used for numerous royal weddings. All of these highly meaningful expressions of tradition were juxtaposed against a moment in time that was anything but traditional. Who could ever have imagined the archbishop of Canterbury presiding in St. George’s Chapel alongside the African-American leader of the Episcopal Church? Not too many years ago, an heir to the throne would have been denied permission to marry a commoner, let along one that is American, divorced, and bi-racial. Marriage was for securing alliances, and marrying for love was not done, yet that is exactly what happened on Saturday. Ceremonies and the traditions expressed through them, bring order and meaning to the passages in our lives. They separate time and announce publicly that who we were and who we are becoming, are two different things. Meghan and Harry would be just as married if they had forgone the elaborate ceremony and eloped to Las Vegas for a quickie service officiated by an Elvis impersonator. But ceremonies, whether they are weddings, commencements, inaugurations, military promotions, or funerals tie us to our roots and help us move forward to embrace life’s next phases. When witnessed by relatives, friends, and others, our support network is signing on to help us achieve success. In academia, May is synonymous with commencement, a ceremony that announces to the world that students have completed their studies, have closed a chapter in their lives, and are ready to join the ranks of educated men and women. Like the royal wedding, commencement embraces traditions that date back to other centuries. The highly symbolic regalia, faculty colors, and the grand procession with its presidential mace and medallion, all harken to the Middle Ages. But like the wedding, today’s ceremonies have also evolved modern modifications, building on the solid base of tradition but interpreting the occasion in the context of our era. We no longer hood students individually but this does not lessen the hood’s symbolism. Technology using computer bar codes lets us project graduates’ names on jumbo screens and while each name may or may not still be read from the podium, mom and dad treasure the iPhone photo they snapped when their child’s name appeared for all to see. Ceremonies and traditions are an important part of our cultural fabric. They let us all know when something truly special is taking place. Modifications occur naturally with the passage of time, but as long as we incorporate them respectfully and meaningfully, they blend with cherished traditions to paint richer, more relevant ceremonies that ensure our celebrations will continue to have memorable meaning for generations to come, just like Meghan and Harry’s very special day.